A pilgrimage has taken place in County Durham in honour of a local saint. The eight-mile walk, from Chester-le-Street to Durham via Finchale Priory, marks the arrival of the relics of St Cuthbert in Durham in 995 AD. More than 200 people took part, culminating in a procession from Market Place to the cathedral, for a prayer service at the saint's shrine. 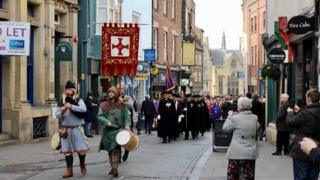 It was part of a series of special services and events at the cathedral marking St Cuthbert's Day. The annual pilgrimage is organised by the Northumbrian Association and Friends of Durham Camino.